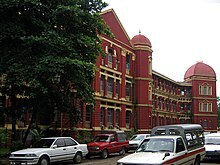 Yangon is the most ethnically diverse city in the country. While Indians formed the slight majority prior to World War II, today, the majority of the population is of indigenous Bamar (Burman) descent. 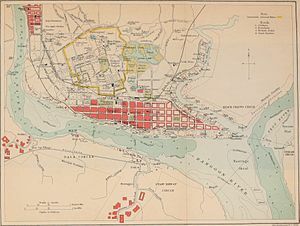 Large communities of Indians/South Asian Burmese and the Chinese Burmese exist especially in the traditional downtown neighbourhoods. 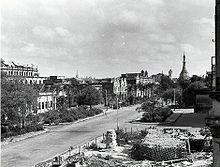 A large number of Rakhine and Karen also live in the city. 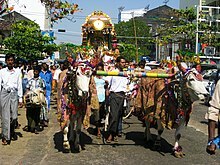 The primary religions practised in Yangon are Buddhism, Christianity, Hinduism, and Islam. Shwedagon Pagoda is a famous religious landmark in the city. ^ a b c Kyaw Kyaw (2006). Frauke Krass; Hartmut Gaese; Mi Mi Kyi, eds. 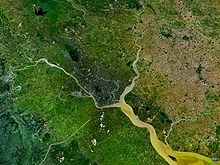 Megacity yangon: transformation processes and modern developments. Berlin: Lit Verlag. pp. 333–334. ISBN 978-3-8258-0042-0. 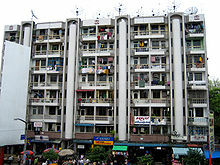 ^ "BBC NEWS | Asia-Pacific | Burma maintains bygone buildings". BBC. 2004-03-30. Retrieved 27 July 2017. ^ Zin Nwe Myint (2006). Frauke Krass; Hartmut Gaese; Mi Mi Kyi, eds. 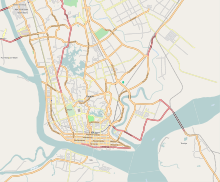 Megacity yangon: transformation processes and modern developments. Berlin: Lit Verlag. p. 264. ISBN 978-3-8258-0042-0. This page was last edited on 1 April 2019, at 09:42 (UTC).